For a long time, cleanliness in cleaning was primarily judged by the absence of all microorganisms. eMC cleaners work probiotically: pathogenic bacteria are permanently removed and surfaces are populated by positive microorganisms. After cleaning, they remain dormant on the surface and are reactivated if there is a recurrence of dirt (e.g. dust). They are space-saving due to low consumption and high dilution rates. 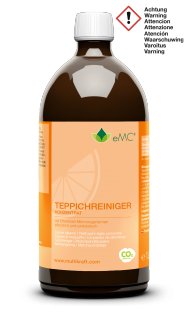 Add eMC All-Purpose Citrus Cleaner and water to the spray bottle and spray the spray solution onto the surfaces - allow to react for a short time and then clean. 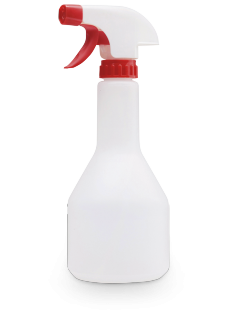 Add eMC cleaner and water to the spray bottle, spray onto the mirror - allow to take effect for a short time and wipe dry with a soft cloth. 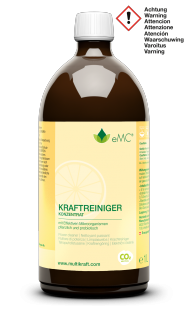 Mix eMC Scale Cleaner into the water in the spray bottle and clean the surfaces with the spray solution. 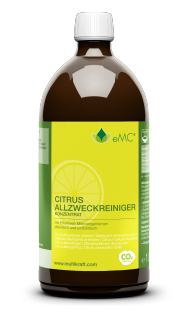 For regular day-to-day cleaning, we also recommend eMC All-Purpose Citrus Cleaner. Do not mix eMC cleaner with excessively hot water - the microorganisms work most effectively in warm water. To reduce water cluster, which results in fewer limescale deposits, fit one EM Ceramic 35 mm Pipe in the cistern. 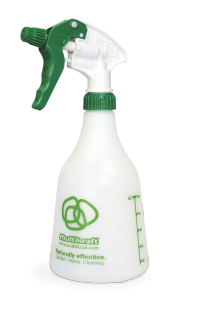 Add eMC Scale Cleaner to water in the spray bottle, spray onto the scaled surface and leave to take effect, then wipe off. Apply 1 to 2 times per week, repeating the application several times if necessary. Do not mix eMC cleaner with excessively hot water - the microorganisms work most effectively in warm water. Mix eMC Power Cleaner into the water bucket and clean the surfaces with the cleaning solution. For the first application, clean the machine thoroughly, then mix eMC Power Cleaner with the water and clean the floors as normal. Replace diluted solution after a week and clean the tank. Do not mix eMC cleaner with excessively hot water - the microorganisms work most effectively in warm water. Mix eMC cleaner with water in the spray bottle, spray on and leave to take effect for a short time, the wipe off with a damp cloth. Do not mix eMC cleaner with excessively hot water - the microorganisms work most effectively in warm water. Alternatively, eMC Power Cleaner can be used. Effective against deposits of all types. Do not mix eMC cleaner with excessively hot water - the microorganisms work most effectively in warm water. Add eMC Kitchen Cleaner to water in the spray bottle, spray onto soiled surfaces, allow to take effect for a short time and wash off. Add eMC Kitchen Cleaner to water in the spray bottle, spray onto dirty crockery, allow to take effect for a short time and wash off or start the dishwasher program. For heavily soiled crockery, cover and leave to take effect overnight. Pour eMC Kitchen Cleaner into the rinsing compartment of the dishwasher - it replaces the rinse aid. The amount of conventional cleaning agent can also be reduced by half, for extremely gentle and environmentally friendly cleaning. 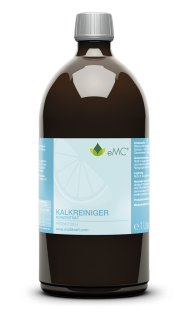 Mix eMC Kitchen Cleaner with water in the spray bottle, spray the spray solution onto the refrigerator, leave to take effect for a short time and wipe off with a damp cloth. Also place 3 EM Ceramics 35 mm Pipes or half a bag of EM Ceramic Grey Pipes (which can be threaded onto a cord and hung up) in the refrigerator. Food stays fresh for longer and unpleasant odours are reduced or eliminated. Add eMC Kitchen Cleaner to water in the spray bottle, spray onto the furniture, leave to take effect for a short time and wipe off with a damp cloth. In case of severe grease deposits, you can leave the solution to take effect for around half an hour and then wipe off. With regular cleaning, Effective Microorganisms are also exceptionally good at repelling bugs. Do not mix eMC cleaner with excessively hot water - the microorganisms work most effectively in warm water. 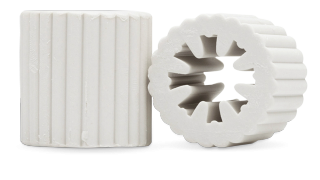 The eMC cleaner keeps the drains clean for much longer and no more blockages can occur. Spray liberally onto soiled surfaces, brush in and leave to take effect for at least 30 minutes. Then vacuum up with a wet or dry vacuum cleaner. For stubborn dirt, increase the application time to as much as 12 hours and repeat if necessary. eMC Carpet Cleaner can also be used on light carpets. For the first application, clean the machine thoroughly, then mix eMC Carpet Cleaner with the water and clean the floors as normal. Mix eMC Cleaner for Textiles with the water in the spray bottle, spray onto soiled textiles, leave to take effect for 10 minutes, then wash off or vacuum. eMC Cleaner for Textiles can also be used on light coloured clothing etc. To eliminate odours, spray a few puffs of EM Clear spray solution onto clothing, curtains and textiles. Mix eMC Cleaner for Textiles with water in the spray bottle and spray onto soiled surfaces, leave to dry and then vacuum off thoroughly. To eliminate odours, spray a few puffs of EM Clear spray solution onto clothing, curtains and textiles. 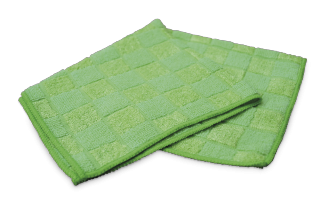 Place eMC Cleaner for Textiles and EM Ceramic Pipes Wash in the washing machine.